Baby T is 18 weeks! Also, the size of a sweet potato! Dec. 1, 2015- Dec. 7 2015. How far along? 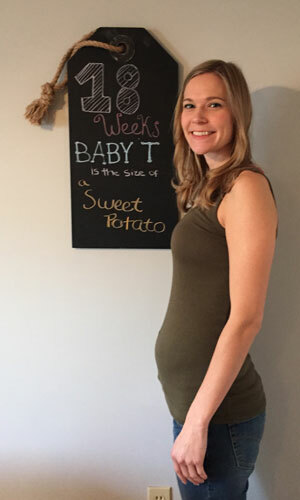 18 Weeks Total weight gain/loss: Up 2 pounds Maternity clothes? None yet Stretch marks? No Sleep: Sleeping pretty good! Best moment this week: I felt the baby move!!! Miss Anything? Not much! Movement: YES! This Thanksgiving I get to eat for two!